Russian government has rejected request by supporters of the Super Eagles of Nigeria to bring in live chickens into the Kaliningrad Stadium.The Kaliningrad Stadium is the venue of Super Eagles’ World Cup opener against Croatia. The match is slated for Saturday 8pm.The Supporters believe that live chicken painted in green and white, brings goodluck for their team.Speaking about the request by the Nigerian supporters, Russian Minister of Culture and Tourism, Andrei Ernak, told interfax.ru that there is no way the supporters from West Africa would be allowed into the stadium with live chickens.Ernak said, ”Our information center FM-2018 receives a lot of various questions.“So, fans from Nigeria asked whether it is possible to go to the stadium with a chicken. This is their symbol, citizens are seen with them in all matches. “We told them that it’s by no means possible to come with a live chicken.”But if the Nigerians are rooting for their team in other places, we will of course advise them where the chicken can be bought.The Nigerian supporters made the same request 8 years ago in South Africa. 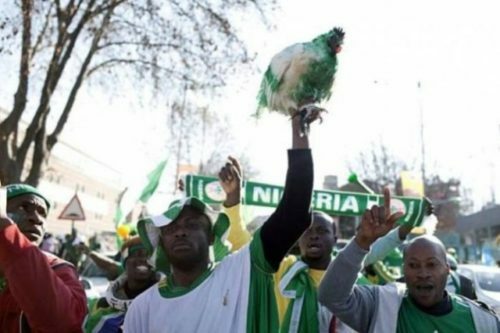 Nigeria fans were turned away from Ellis Park in Johannesburg after demanding to take chickens, painted green into the stadium where the team lost 1-0 to Argentina.